I get a lot of questions on lipstick–naturally, being a red lipstick aficionado. I know I mention my favorites here and there, but I still end up getting constant emails about the one question–how do you get that damn red lipstick to stay in place?! Well. Good news. I'll tell you. How do I know? I've tried everything. ...Just not as well as the lip product trifecta I discovered last year. I actually stumbled upon them on accident–I was buying a new shade of lipstick for a wedding and totally got upsold at the M.A.C. counter–luckily, it was the best deal I ever got sucked into! Here are the three products I swear by to get long-lasting red lips! If we're being honest here, I think this product is what does most of the "stay on your lips forever" heavy lifting. Use this after you've swiped on the primer, and fill in your entire lip with it. (Sometimes I'll just apply this and swipe a clear balm on top, if I'm feeling experimental. That doesn't last as long though–gloss comes off much faster!) This stuff basically acts like a glue for the lipstick that you apply on top of it. Make sure to get a shade that is a close match to your lipstick! 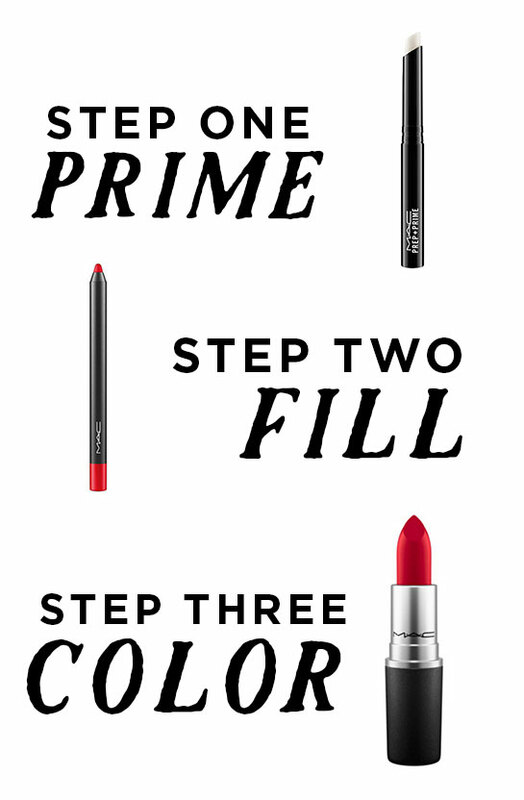 Of course, you definitely don't have to use MAC lipstick in this third step, but it just tends to be my favorite brand! They have the best colors, and I think their matte formula stays on better than any other brand! I really like their sales staff, too–they're always super helpful and do a good job of recommending the best colors for your skin tone! There you have it–my 3 product process for getting the perfect, no-smudge lipstick! Do you have any other long-wear beauty tips?